ZEN The Intercontinental's Cantonese restaurant dishes up reliable renditions of spring rolls, turnip cakes and barbequed pork buns in a rarefied atmosphere. The Deluxe Restaurant A very tasty Cantonese restaurant, housed in the Gongti Comfort Inn Hotel. Service is good, and the egg tarts are highly recommended. 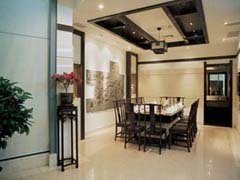 Shang Palace With a garden view, it's a great option for Sunday brunch, Cantonese style. Noble Court Hong Kong chefs serve up Cantonese haute cuisine in the classy confines of one grand restaurant worthy of the name "noble." Lijing Xuan Enter this golden palace at any hour, night or day, and there will be a crowd feasting on fresh and steaming baskets of dim sum. They are famous for porridge, but many Westerners find it to be an acquired taste. 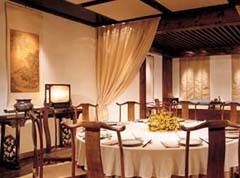 Huang Ting Fancy-pants Cantonese cuisine (including dim sum) amidst Ming and Qing dynasty antiques for those using the corporate credit card. GL Cafe Hong Kong fare served in a vast cafeteria; cheap, greasy and always open: perfect for 4am feasts. 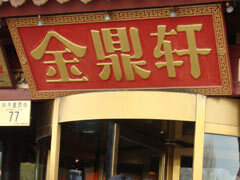 Jin Ding Xuan Cantonese chain that is specializes in fresh and steaming baskets of dim sum.